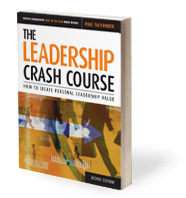 The Leadership Crash Course is an action-oriented, pragmatic guide to help executives and managers analyze their leadership strengths and weaknesses and then systematically build their leadership capabilities to exert greater impact. Welcome to the The Leadership Crash Course Web site, your portal for new insights and practical advice on becoming a better, more influential leader. This site provides both an introduction to the concepts and course work in the book and an opportunity to explore them further through a set of unique interactive tools. Before you can start practicing the behaviors, skills and tactics of a leader, you need to understand your own propensity for leadership. One quick way of doing this is to complete our self-diagnostic and see where you score. Can I learn how to be a leader? Leadership is about getting people to achieve new things; therefore it's often about change. But change doesn't come easy, whether the goal is reinventing yourself or an enterprise. Learn about the five leadership behaviors critical to conquering inertia.